This paper shows that the family continues to be an important source of support for the rural elderly, particularly the rural elderly over 70 years of age. Decline in likelihood of co-residence with, or in close proximity to, adult children raises the possibility that China’s rural elderly will receive less support in the forms of both income and in-kind instrumental care. While descriptive evidence on net-financial transfers suggests that elderly with migrant children will receive similar levels of financial transfers as those without migrant children, the predicted variance associated with these transfers implies a higher risk that elderly who have migrant children could fall into poverty. Reducing the risk of low incomes among the elderly is one important motive for new rural pension initiatives supported by China’s government, which are scheduled to be expanded to cover all rural counties by the end of the 12th Five Year Plan in 2016. 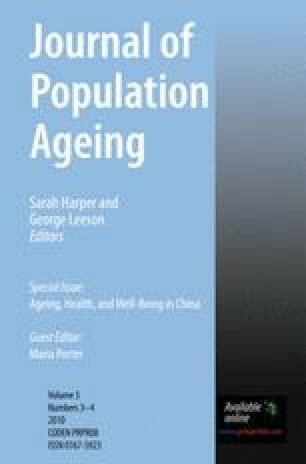 Ageing Elder support Intergenerational transfers Migration China. This paper has benefitted from the helpful suggestions of Emmanuel Jimenez, Phillip O’Keefe, Robert Palacios, Maria Porter, Adam Wagstaff and Xiaoqing Yu and from comments on an early presentation of this work from participants at the Association for Public Policy Analysis and Management (APPAM) meetings held in Los Angeles, November 6–8, 2008. We are also grateful for financial support for supplemental data collection which from the National Science Foundation (SES-0214702), the Michigan State University Intramural Research Grants Program, the Ford Foundation (Beijing), the Weatherhead Center for International Affairs (Academy Scholars Program) at Harvard University and the Center for Retirement Research at Boston College. Marriage Law. (2001). The marriage law of the people’s republic of China, Section 3, Article 21. Available online at http://www.nyconsulate.prchina.org/eng/lsqz/laws/t42222.htm.